I recently told you about the number one reason why my clients are not leveraging Live Video on Facebook. Once they've identified what they will talk about, the number two reason people are not going Live is that they are nervous about what exactly to say. When it comes to Facebook Live, a script is not necessary for broadcasts, however an outline can be really helpful. That's why I've created an easy-to-follow checklist for structuring your Facebook Live broadcast. Note: If you are nervous and want to practice first, you can practice going Live by setting your audience on your personal profile to “Only Me” before you go Live – then, just remember to change it back before the real deal! since it takes a moment for Facebook to serve your Live video, people will not see the first second or two live, so thank them for joining you before you move on to other things. give them a reason to stick around. Tease what you are going to tell them, what value they will receive from investing a couple minutes with you. who are you, and why should they listen to what you have to say? Where are they joining from? Share their location in the comments. Make it a little more exciting and offer a giveaway to one person who guesses YOUR favorite color (or whatever the random question is). Announce the winner Live NEXT week. Make sure that people learned something from the video and identify 3 points you will discuss during your broadcast. Try to make each of these 3 topics something you can linger on for a minute or two, especially since we're aiming for 10 minutes Live! Let your audience know that they can tap on the Follow button on live videos and videos that were live, and then opt-in to get notifications the next time you go live. Once they've made it this far, they're likely to want to see more of you! Thank everyone for spending a few minutes with you and let them know you'll be live again next week – at the same day/time – make sure you say the day and time with time zone (Wednesday at noon central time, for example). Showing up consistently is a great way to build trusting relationships with your fans. Also, it may seem obvious, but make sure you say “Bye!” just like you would if you were hanging up a phone call. This is not a pre-recorded video, your viewers feel connected with you on social media, and it's most polite to be conversational throughout the broadcast, and end it in a similar conversational way. 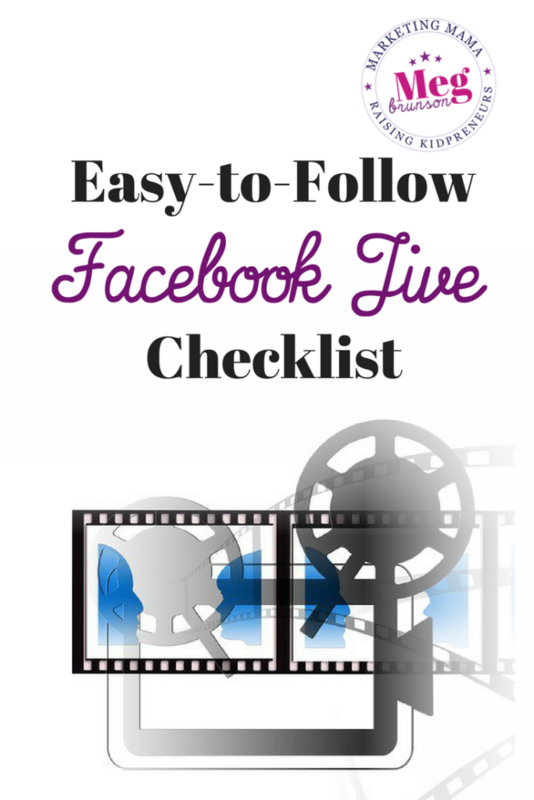 Wish you had a printable version of the checklist? Or, an easy to follow getting started guide? I have assembled a FREE downloadable workbook that will walk you through the process of going Live quickly, easily, and effectively! This is the exact strategy I am implementing in my business, especially given the recent algorithm changes on Facebook. Plus, I recorded video files to support you page-by-page through the guide. Get the Figure Out Facebook Live Strategy HERE!